Give your taste buds a fiesta of flavors with our Pollo en Pipian Verde. 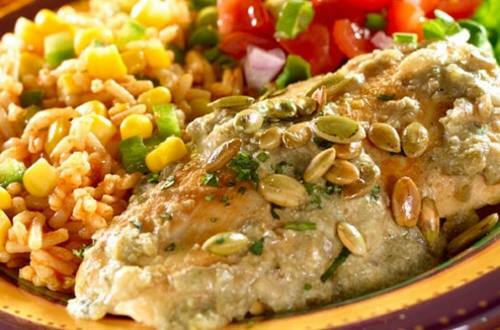 It's an exquisite Mexican chicken recipe featuring fresh salsa verde, pumpkin seeds and other popular Mexican seasoning that makes you hungry just thinking about it. 1 Mash Knorr® Chicken flavor Bouillon Cube(s) with a fork in a small glass bowl or measuring cup. Microwave at HIGH for 20 seconds or until bouillon is softened. Stir until smooth. Rub mixture evenly over chicken breasts. 2 Heat remaining 1 tablespoon olive oil in a large skillet over medium-high heat and cook chicken about 8 minutes or until thoroughly cooked, turning once. Remove and keep warm. 3 Cook onion over medium heat about 4 minutes or until onion is tender, stirring occasionally. Add garlic and cook about 30 seconds. Add ground pumpkin seeds and cook about 2 minutes, stirring occasionally. Stir in salsa verde and simmer about 1 minute. Return chicken to skillet and heat through, turning once. Garnish with chopped fresh cilantro and additional toasted pumpkin seeds.